I have been busy making some items to donate to a charity auction. A friend of my Aunt lost her grandbaby, she was only 3 or 6 months old...never left the hospital...very sad. They are having an auction to raise money to help with the funeral cost and maybe some of the hospital bills, I'm not sure. I think having to live at or by the hospital for all those months could not have been cheap either. I made this heart shaped basket out of a variety of pink fabrics. 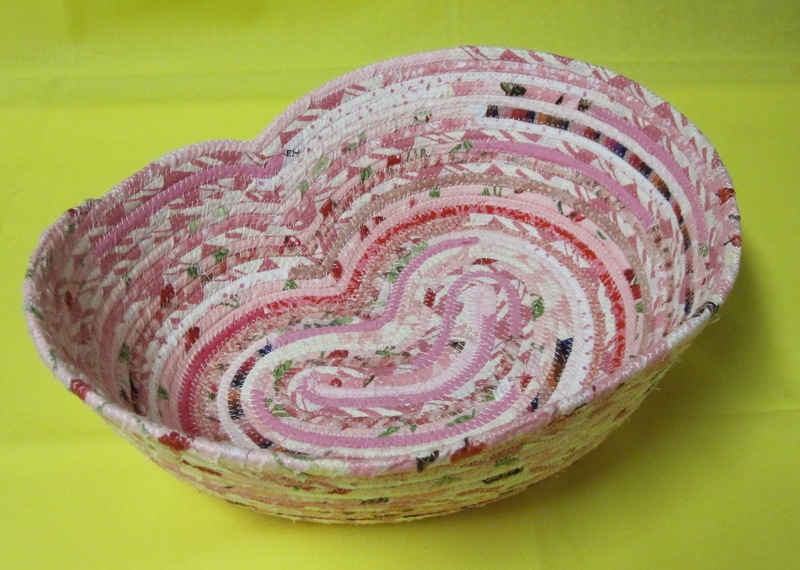 It's actually the left over "pinks" from a heart shaped basket I made for my aunt!! I ran across this bowl pattern when I was cleaning out a drawer, and I thought it would be fun to give it a try and donate it too. 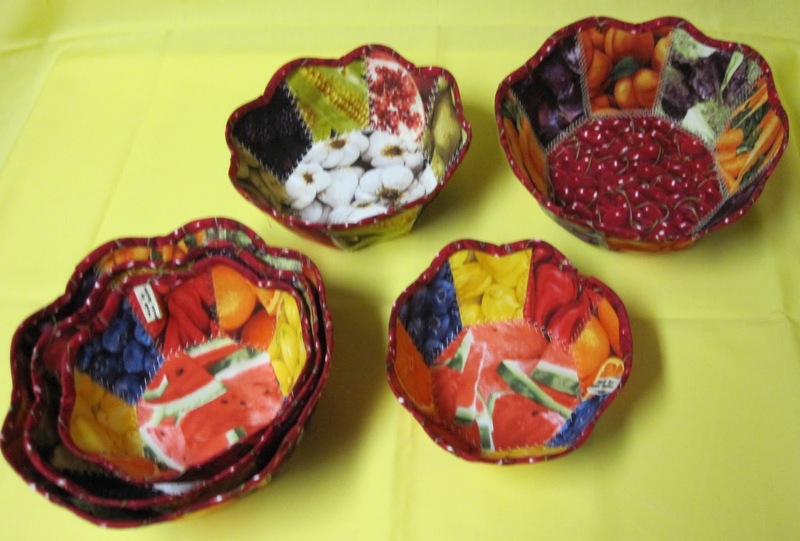 I used my scrap fruit and veggie fabric and since I have so much I made two sets. The sides are just butted up against each other and sewn together, so you have to make sure you choose a stitch that will give it support. One of my choices was a little weak but I think it should be fine. The second set of bowls I thought I would give to an acquaintance of mine, Alex. She is a librarian that works at my branch down the road. She is always excited about my book selections on homesteading, gardening, chickens, etc. She says some day she too wants to leave the city and enjoy the country life and raise some animals and garden. So I thought it would be lovely to give her a set of these. Won't she be thrilled. Or she might just think "That strange older gentleman in giving me gifts now...Creepy!!" VERY VERY NICE! I LOVE THE VEGGIE BOWLS. I MAY HAVE TO BID ON THEM. That is so sweet of you!